Alex Danson MBE is one of the finest hockey players Britain has ever produced and one of the best players in the World today. At Rio 2016 Alex was a member of the GB women’s hockey team that made history by winning a Gold medal, the first time a GB women’s hockey team had ever become Olympic Champions. The Olympic final versus The Netherlands was watched live by over 9 million people on BBC TV. She made her senior international debut at the age of just 16 whilst still at school, and is now closing in on 300 caps for her country and has scored more than 100 goals over an international career spanning 16 years. 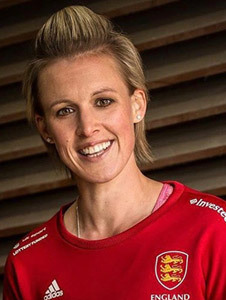 Alex has been shortlisted for the FIH World Player of the Year 4 times (including 2017), was Player of the Tournament at the 2015 European Championships, and was top scorer at both the London 2012 and Rio 2016 Olympic Games. In 2017 she was made captain of GB and England . In her spare time Alex is a Sky Sports ‘Living for Sport’ Athlete mentor where she shares her experiences as an athlete to schools all around the country. Through this work she was recognised by UK Sport in 2015 for having given more volunteering days (209 days) than any other UK Sport funded athlete. She also sits on the Board of Commonwealth Games England as their athlete representative. She is a highly articulate and confident speaker that has the ability to tailor her experiences as an athlete to whichever audience she is with.